Now is the time to make over your kitchen so that it meets the needs of your household today. The space was fine when you bought your home, but the floor is scuffed, the paint is fading, and the cabinets are scratched. Turn to the professionals in our local store for kitchen remodeling in Hammonton, NJ. As a kitchen remodeling contractor, we do it all, from design to sales to installation. You do not need to go elsewhere for products or services. Our store is a one-stop shop. 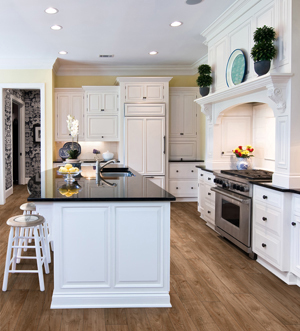 Come to us for brand-name products on flooring and cabinets, as well as to schedule professional installation. You and your family spend a great deal of time in the kitchen. Not only is this a place to prepare food, it is a space where your family gathers for together time. Make this room beautiful and functional with assistance from our kitchen renovation contractor. Our goal is to work with you to create your dream kitchen. Our store offers custom kitchen remodeling. Essentially, this means that our professionals work hand-in-hand with you throughout the process. We recommend that you begin with a free design consultation. Our professionals come to your home to get a feel for what your project requires. During this time, we talk to you about what you want, whether a full or partial remodel. A full remodel involves replacing everything in your kitchen. By the time, we are finished, you have brand new kitchen to make your family’s favorite meals. Partial remodeling can involve whatever fixtures and features you would like replaced, from flooring to cabinets to countertops to paint, as well as services from plumbing to electrical work to installation. We have professional designers on staff so you have someone with training and skill to oversee your project. Our job is to listen to you tell us what you want and then to supply you with products and services for a successful kitchen makeover. It is not our practice to send our customers home with a truck full of products that they have to install. We send you a team of professionals to handle each phase of your makeover, from putting in the flooring to painting the walls to installing cabinets and countertops. From our experience, we have learned that professional installation is essential for the success and longevity of your remodel. Just ask us to schedule a convenient day and time for your custom kitchen renovation. Create your dream kitchen by contacting us for remodeling products and services. We proudly serve customers in Hammonton, Cape May, Vineland, Ocean City, and Atlantic City, New Jersey, and the surrounding areas.